Before the poker boom began around 2004, limit hold’em was often the game of choice for most players. 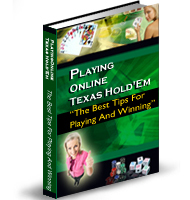 Limit hold’em is a complex game, offering opportunity for steady profit with solid play. Limit hold’em requires patience, self-discipline and solid judgment at the poker table. It is a far less volatile game than its currently more popular no-limit version which is quite good for bankroll management. When I play, I often look for a limit game before I commit to a no-limit table especially when I have hit a streak of bad luck and my bankroll is shrinking playing no-limit. If you cut your teeth playing no-limit poker, then switching to limit hold’em will be a shock to your system. Aggression is the foundation of no-limit hold’em. Aggression is rewarded mainly because the aggressor controls the price of a call. This simply is not the case with limit hold’em. Aggressive no-limit players must gear their aggression down without a hand. Bluffing in limit happens but it is not often rewarded with scooping a pot. This doesn’t mean that you don’t play your big hands strongly, it simply means that you are far more selective about entering a pot. Multi-way pots are common in limit hold’em. Players are far more willing to risk a small bet to see a flop than they are to commit chips to a pot in no-limit. With more players seeing the flop the value of your hole cards is reduced. While AA plays well against a single opponent winning around 85% of the time, against two or three opponents the value is significantly diminished. More hands go to showdown in limit hold’em than do in the more volatile no-limit game. This means that it is unlikely that a pre-flop raise will steal blinds or win small pots. Remember, the limit game restricts your maximum bet to increments of the big blind. In the early rounds your bet can only be a small bet and your raise can only be one more small bet. The turn and river increase the limits to increments of one big bet. It isn’t too expensive to chase a big draw under these circumstances. The biggest mistake that players moving from no-limit to limit hold’em make is in hand selection. No-limit, because of its aggressive nature, allows for a wider range of pre-flop hands to bluff at the pot. In limit bluffing is rarely successful and so is rarely practiced. This means that hand selection is now crucial. You are going to face two to three and, on occasion more, opponents in every hand you chose to enter. This means your hand plays with a diminished value when against multiple players as opposed to playing heads-up. Since hands play with less value it follows that stronger hands should be selected as starting hands in limit poker. In addition to reigning in your hand selection choices, it is important to read your opponents’ hands, to assess where you stand in relation to other hands in play. Watch for tells, especially the tell that comes from patterns of play. Careful observation of your opponents’ play in given situations such as flop texture, position, and how they play against specific players are all weapons in your arsenal. Physical tells are also important, but against good players they are often done to deceive opponents and are, therefore, less valuable than patterns of play. In fact, the most valuable tell at the poker table is how your opponent plays the game making your observational skills far more important than looking for physical tells. Patience in poker is always a virtue. In limit poker it rises to the level of sacred duty. A random deal of any two cards means that the vast majority of hands you are dealt are unplayable. You can’t even bluff with a strong suited connector like 8h9h because you have no way of driving someone with a big pair off his hand. You must develop the discipline to muck hands you don’t like and the patience to wait for one you really like. While it is tempting to play a hand once in a while when you have been throwing all of your hands into the muck, you must develop the patience to resist playing until your hand is actually playable. Patience is easily developed and practiced when you are winning. The trick is to make it habitual especially when you are losing. One of the crucial skills for solid play is making the decision to play or not to play. Winning or losing money in any particular session should have absolutely nothing to do with this decision. If the game is good, you are playing well and you have solid concentration then stay in your seat and play. By a good game I really mean one in which you are favored to win against the players in the game. The minute your concentration begins to fade, you go on tilt, or something else is interfering with your ability to maintain your play at the highest level it is time to take a break for a while or just give up for the night. Playing when not at your best leads to inferior play and inferior play translates into significant losses. Playing limit hold’em is something like going to work and being paid by the hour. Gains are measured in big bets won per hour. It follows that the more you play the more money you’ll make. Grinding out a living at the limit hold’em table is not very different from grinding out a living as a salesman, a carpenter or anything else for that matter. You show up for work, buy-in to a game (chips are your inventory) and play. Like any other job, if it is worth your time and effort then it is worth your best effort all the time. Make no mistake, anything less is a sure road to big losses. Roger Fischel began playing poker with his friends in high school. Seven Card Stud and Five Card Draw were the games of choice back then. Over the years, Roger turned to Texas Hold ‘em as his game of choice. During a long career as a teacher, Roger learned the value of sharing what he knows with others as a way to give back to the community in which he shares, thus, Rags to the River Poker was born. Come and visit.